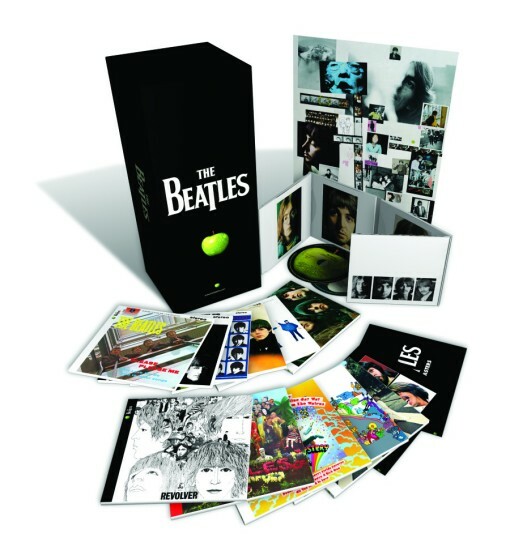 Today, from 2PM-3PM EST (11AM -12PM PST), The Beatles Remastered (Stereo) Box Set will be on sale at Amazon.com for a very reasonable $99.99 (that’s like $6.19 a disc). Also, in case you forgot, I’m giving a Beatles Holiday Poster over here. Where do they list it for $99.99? It is listed for $177. Do I have to wait until 2pm? Yes, it’s a “Lightning Deal” from 2PM-3PM EST only. You can see it as an “upcoming deal” if you scroll through here (if the link works). There are plenty of Beatles box sets, though. Amazon doesn’t indicate (at least pre-sale) which box set it is. For that price, I can’t imagine it is anything but the stereo box. It was it… but they must’ve only offered one, as it was “claimed” in a nanosecond. Bummer. they sold in 4 minutes. enough time to buy one if you logged on right at 1pm CST. got one for my pops! They are nowhere to be found now!!!! Anybody with a suggestion on where to find this before Christmas??? Amazon is not sold out, price is back up to $175.49 though.